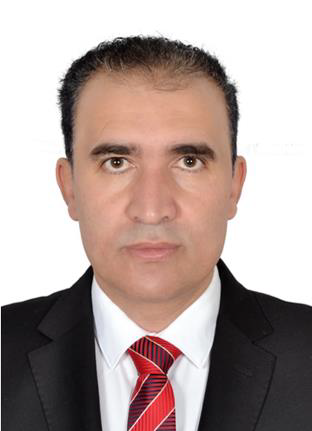 Biography: He is working as a Professor (Pharmaceutical Organic Chemistry), Pharmacy Committee for promotion of associate Professors and full professors, Supreme Council of Universities, Egypt, April 2015. He worked as a Associate Professor (Pharmaceutical Organic Chemistry), Pharmacy Committee for promotion of associate Professors and full professors, Supreme Council of Universities, Egypt, April 2010. he completed his PhD in Pharmaceutical Sciences (Organic Chemistry), Faculty of Pharmacy, Cairo University, Egypt, January 2005 (Title: Synthesis of certain novel pyridothiopyranoindazoles as potential DNA intercalators in cancer chemotherapy). He completed his M.Sc. in Pharmaceutical Sciences (Organic Chemistry), Faculty of Pharmacy, Cairo University, Egypt, July 2001 (Title: Synthesis of certain novel benzothiopyranopyridinones as potential schistosomicidal agents). He completed his B.Sc. (Bachelor degree in Pharmaceutical Sciences), very good with honor, Faculty of Pharmacy, Cairo University, Egypt, May 1994. Design, synthesis, modeling studies and biological evaluation of thiazolidine derivatives containing pyrazole core as potential anti-diabetic PPAR-γ agonists and anti-inflammatory COX-2 selective inhibitors. Abdellatif, K .R. A., Fadaly, W. A. A., Kamel, G. M. Elshaier, Y. A. M. M., El-Maged, M. A. Bioorganic Chemistry, 2019, 82, 86-99. https://doi.org/10.1016/j.bioorg.2018.09.034. 2. Anti-inflammatory indomethacin analogs endowed with preferential COX-2 inhibitory activity. Amin, N. H., El-Saadi M. T., Hefny, A. A., Amin, N. H., Elshemy, H. A. A., Abdellatif, K. R. A. Future Medicinal Chemistry, 2018, 10 (21), 2521–2535. 3. Design, synthesis and anticancer evaluation of novel spirobenzo[h]chromene and spirochromane derivatives with dual EGFR and B-RAF inhibitory activities. Abdelatef, S. A., El-Saadi, M. T., Amin, N. H., Abdelazeem, A. H., Abdellatif, K. R. A. European Journal of Medicinal Chemistry, 2018, 150, 567-578. https://doi.org/10.1016/j.ejmech.2018.03.001. 4. Non-acidic 1,3,4-trisubstituted-pyrazole derivatives as lonazolac analogs with promising COX-2 selectivity, anti-inflammatory activity and gastric safety profile. Abdellatif, K .R. A., Fadaly, W. A. A., Elshaier, Y. A. M. M., Kamel, G. M. Bioorganic Chemistry, 2018, 77, 568-578. 5. Novel 4-methylsulfonylphenyl derivatives as NSAIDS with preferential COX-2 inhibition. Abdelatef, S. A., El-Saadi, M. T., Amin, N. H., Abdelazeem, A. H., Abdellatif, K. R. A. Journal of Applied Pharmaceutical Science, 2018, 8(1), 009-016. 6. New advances in synthesis and clinical aspects of pyrazolo[3,4-d]pyrimidine scaffolds. Abdellatif, K. R. A.; Bakr, R. B. Bioorganic Chemistry, 2018, 78, 341-357. DOI: https://doi.org/10.1016/j.bioorg.2018.03.032. 7. Novel 4-methylsulfonylphenyl derivatives as NSAIDS with preferential COX-2 inhibition. Amin, N. H.; Mohammed A. A.; Abdellatif, K. R. A. Future Medicinal Chemistry, 2018, 10 (1), 53-70, DOI: 10.4155/fmc-2017-0153. 8. Evaluation and optimization of pH-responsive niosomes as a carrier for efficient treatment of breast cancer. Salem, H. F.; Kharshoum, R. M.; Abo El-Ela, F. I.; Gamal, A. F.; Abdellatif, K. R. A. Drug Delivery and Translational Research, 2018, https://doi.org/10.1007/s13346-018-0499-3. 9. 2,4-Disubstituted Phenylhydrazonopyrazolone and Isoxazolone Derivatives as Antibacterial Agents: Synthesis, Preliminary Biological Evaluation and Docking Studies. Oraby, A. K.; Abdellatif, K. R. A.; Abdelgawad, M. A.; Attia, K. M.; Georghiou, P. E.; Dawe, L. N. Chemistry Select, 2018, 3 (11), 3295-3301. DOI: 10.1002/slct.201800174. 10. Design, Synthesis and Cytotoxicity Evaluation of New 3, 5-Disubstituted-2-Thioxoimidazolidinones. Abdellatif, K. R. A.; Elbadawi, M. M.; Elsaady M. T.; Abd El-Hafeeze, A. A.; Fujimurae, T.; Kawamotoe S.; Khodair, A. I. Anti-Cancer Agents in Medicinal Chemistry, 2018, 18 (4), 573–582. DOI:10.2174/1871520618666171129213838. 11. Design, synthesis, and biological evaluation of 2-(4-(methylsulfonyl)phenyl) indole derivatives with promising COX-2 inhibitory activity. Ahmed M. M. Shaker, A. M. M., Abdelall, E. K. A., Abdellatif, K. R. A., Abdel-Rahman, H. M. Journal of Applied Pharmaceutical Science, 2018, 8 (11): 1-8. 12. Synthesis, EGFR Inhibition and Anti-cancer Activity of New 3,6-dimethyl-1-phenyl4-(substituted-methoxy)pyrazolo[3,4-d]pyrimidine Derivatives. Rania B. B.; Mehney A. B.; Abdellatif, K. R. A. Anti-Cancer Agents in Medicinal Chemistry, 2017, 17 (10), 1389-1400. 14. Design, synthesis, molecular docking and cytotoxicity evaluation of some novel 5-arylidene-3-(substituted phenyl)-2-(p-tolylamino)-4-imidazolones. Ahmed I. KhodairA. ; Elbadawi M. M.; , Elsaady M. T.; Abdellatif K. R. A. Journal of Applied Pharmaceutical Science, 2017, 7 (9), 58-68. 15. Nitric Oxide-NSAIDs Donor Prodrugs as Hybrid Safe Anti-inflammatory Agents. Abdellatif, K. R. A.; Abdelall, E. K. A.; Bakr, R. B. Current Topics in Medicinal Chemistry, 2017, 17, 941-955. 16. Design, Synthesis and biological evaluation of some novel indole derivatives as selective COX-2 inhibitors. Abdellatif K. R. A; Elsaady M. T.; Amin N. A.; Hefny A. A. Journal of Applied Pharmaceutical Science, 2017, 7 (8): 69-77. 17. Design, synthesis, cyclooxygenase inhibition and biological evaluation of new 1,3,5-triaryl-4,5-dihydro-1H-pyrazole derivatives possessing amino/methanesulfonyl pharmacophore. Abdellatif, K. R. A. Fadally, W. A. A. Bioorganic Chemistry, 2017, 70, 57-66 DOI: http://dx.doi.org/ 10.1016/j.bioorg.2016.11.008. 18. New 1,2-diaryl-4-substituted-benzylidene-5-4H-imidazolone derivatives: design, synthesis and biological evaluation as potential anti-inflammatory and analgesic agents. Abdellatif, K. R. A. Fadally, W. A. A. Bioorganic Chemistry, 2017, 72, 123-129, DOI: http://dx.doi.org/ 10.1016/j.bioorg.2016.11.008. 19. Design, synthesis and biological evaluation of new 4-(4-substitutedanilino)quinoline derivatives as anticancer agents. Abdellatif, K. R. A.; Abdelall, E. K. A.; Abdelgawad, M. A.; Amin; D. A. E.; Omar; H. M. Medicinal Chemistry Research, 2017, 26, 929–939, DOI: 10.1007/s00044-017-1798-9. 20. Synthesis, Anti-inflammatory and Molecular Docking Study of Schiff Bases Containing Methanesulphonyl Pharmacophore. Abdellatif, K. R. A. Elsaady, M. T.; Abdel-Azizd S. A.; Abu Sabah, A. H. A. Letters in Drug Design and Discovery, 2017, 14, 930-937, DOI: 10.2174/15701808146661612141637 59. 21. Design, Synthesis, Antioxidant and Anticancer Activity of New Coumarin Derivatives Linked with Thiazole, Isoxazole or Pyrazole Moiety. Abdellatif, K. R. A.; Abdelgawad, M. A.; Elshemy, H. A. H.; Kahk, N. M. Letters in Drug Design and Discovery, 2017, 14, 773-781, DOI: 10.2174/15701808136661610261537 43. 22. Synthesis and biological screening of some novel celecoxib and etoricoxib analogs with promising COX-2 selectivity, anti-inflammatory activity and gastric safety profile. Alsayed, S. S. R.; Elshemy, H. A. H.; Abdelgawad, M. A.; Abdel-Latif, M. S.; Abdellatif, K. R. A. Bioorganic Chemistry, 2017, 70, 173-183, DOI: 10.1016/j.bioorg.2016.12.008. 24. Synthesis, cyclooxygenase inhibition, anti-inflammatory evaluation and ulcerogenic liability of new 1,3,5-triarylpyrazoline derivatives possessing methanesulphonyl pharmacophore. Abdellatif, K. R. A. Fadally, W. A.; Azouz, A. A. Archiv Der Pharmazie, 2016, 349, 801–807. 25. Synthesis, cyclooxygenase inhibition, anti-inflammatory evaluation and ulcerogenic liability of 1-phenylpyrazolo[3,4-d]pyrimidine derivatives. Bakr, R. B.; Azouz, A. A.; Abdellatif, K. R. A. Journal of enzyme inhibition and medicinal chemistry, 2016, 349, 801-807. 26. Synthesis and Antimicrobial Activities of a Series of Disubstitutedarylazo-Barbituric- and Thiobarbituric Acid Derivatives. Oraby, A. K.; Abdellatif, K. R. A.; Abdelgawad, M. A.; Attia, K. M.; Georghiou, P. E. International Journal of Pharmaceutical Chemistry, 2016, 6 (4), 100-106. 27. Synthesis, cyclooxygenase inhibition and anti-inflammatory evaluation of new 1,3,5-triaryl-4,5-dihydro-1H-pyrazole derivatives possessing methanesulphonyl pharmacophore. Abdellatif, K. R. A.; Mohammed T. Elsaady, M. T.; Salah A. Abdel-Aziz, S. A.; Abusabaa, A. H. A. Journal of enzyme inhibition and medicinal chemistry, 2016, 31 (6), 1545-1555. 28. Design, Synthesis and biological screening of new 4-thiazolidinone derivatives with promising COX-2 selectivity, anti-inflammatory activity and gastric safety profile. Abdellatif, K. R. A.; Abdelgawad, M. A.; Elshemy, H. A. H.; Alsayed, S. S. R. Bioorganic Chemistry, 2016, 64, 1-12. 29. Design, Synthesis and biological evaluation of new pyrroloazepines with potential and selective antitumor activity. 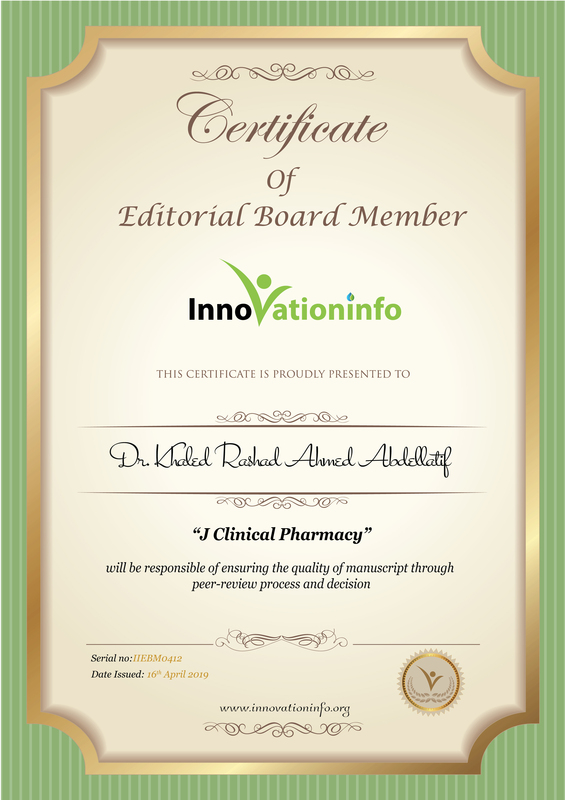 Dareen A. Jaiash; Amany Belal, Mohamed A. Abdelgawad and Abdellatif, K. R. A., Acta Poloniae Pharmaceutica Drug Research, 2016, 37 (2), 359-368. 30. Synthesis, cyclooxygenase inhibition, anti-inflammatory evaluation and ulcerogenic liability of new 1,3,5-triarylpyrazoline and 1,5-diarylpyrazole derivatives as selective COX-2 inhibitors. Abdellatif, K. R. A.; Abdelall, E. K.; Fadally, W.; Kamel, G. Bioorganic & Medicinal Chemistry Letters 2016, 26, 406-412. 31. Design and synthesis of certain novel bicoumarin derivatives asanticancer agents. Abdellatif, K. R. A.; Abdelgawad, M. A.; Elshemy, H. A. H.; Kahk, N. M. Der Pharma Chemica, 2016, 8(3), 13-19. 32. Synthesis of some benzoxazole derivatives and their anti-inflammatory evaluation. Abdellatif, K. R. A.; Amin, N. H.; Mohammed, A. A. Journal of Chemical and Pharmaceutical Research, 2016, 8(4), 1253-1261. 33. Methyl-2-phenyl-1-substituted-indole derivatives as indomethacin analogs: design, synthesis and biological evaluation as potential anti-inflammatory and analgesic agents. Abdellatif, K. R. A.; Phoebe F. Lamie, and Hany A. Omar. Journal of enzyme inhibition and medicinal chemistry, 2016, 31 (2), 318-324. 34. Synthesis, cyclooxygenase inhibition, anti-inflammatory evaluation and ulcerogenic liability of novel triarylpyrazoline derivatives as selective COX-2 inhibitors. Abdellatif, K. R. A.; Abdelgawad, M. A.; Madlen, B. L.; Zidan, T. H. Bioorganic & Medicinal Chemistry Letters, 2015, 25 (24), 5787-5791. 35. Synthesis, cyclooxygenase inhibition and anti-inflammatory evaluation of novel diarylheterocycles with a central pyrazole, pyrazoline or pyridine ring. Abdellatif, K. R. A.; Abdelall, E. K.; Fadally, W.; Kamel, G. Medicinal Chemistry Research, 2015, 24, 2632-2644. 36. 1-(4-Methane(amino)sulfonylphenyl)-3-(4-substituted-phenyl)-5-(4-trifluoro-methylphenyl)-1H-2-pyrazolines/ pyrazoles as potential anti-inflammatory agents. Abdellatif, K. R. A.; Elshemy, H. A. H.; Azouz, A. A. Bioorganic Chemistry 2015, 63, 13-23. 37. Synthesis and anti-inflammatory evaluation of new 1,3,5-triaryl-4,5-dihydro-1H-pyrazole derivatives possessing an aminosulphonyl pharmacophore. Abdellatif, K. R. A.; Abdelgawad, M. A.; Elshemy, H. A. H.; Alsayed, S. S. R.; Kamel, G. Archives of Pharmacal Research, 2015, 38, 1932-1942. 38. Design and synthesis of certain novel arylidene thiazolidinone derivatives as anticancer agents. Abdellatif, K. R. A.; Abdelall, E. K. A.; Abdelgawad, M. A.; Abdelhakeem, M. M.; Omar, H. A. Der Pharma Chemica, 2015, 7(8), 149-161. 39. Synthesis, characterization and biological evaluation of novel 4--fluoro-2--hydroxychalcone derivatives as antioxidant, anti-inflammatory and analgesic agents. Abdellatif, K. R. A.; Heba A. H. Elshemy, Samir A. Salama, and Hany A. Omar. Journal of enzyme inhibition and medicinal chemistry 2015, 30 (3), 484-491. 40. Synthesis of new 1-(4-methane(amino)sulfonylphenyl)-5-(4-substituted-aminomethylphenyl)-3-trifluoromethyl-1H-pyrazoles: A search for novel nitric oxide donor anti-inflammatory agents. Abdellatif, K. R. A.; Moawad, A.; Knaus, E. E. Bioorganic & Medicinal Chemistry Letters 2014, 24, 5015-5021. 41. Synthesis and anticancer activity of some new pyrazolo[3,4-d]pyrimidin-4-onederivatives. Abdellatif, K. R. A.; Abdelall, E. K. A.; Abdelgawad, M. A.; Ahmed, R. A.; Bakr, R. B. Molecules 2014, 19, 3297-3309. 42. Design, synthesis and anticancer screening of novel pyrazole derivatives linking to benzimidazole, benzoxazole and benzothiazole. Abdelgawad, M. A.; Abdellatif, K. R. A.; Ahmed, O. M. Medicinal Chemistry an Open Access 2014, S1, 1-7. 43. Design, synthesis and pharmaological evaluation of novel pyrrolizine derivatives as potential anticancer agents. Gouda, A. M; Abdelazeem, A. H.; Arafa, E. A.; Abdellatif, K. R. A. Bioorganic Chemistry 2014, 53, 1-7. 44. Synthesis, docking study and antitumor evaluation of certain newly synthesized pyrazolo[3,4-d]pyrimidine derivative. Abdellatif, K. R. A.; Abdelall, E. K. A.; Abdelgawad, M. A.; Ahmed, R. A.; Bakr, R. B. Organic Chemistry An Indian Journal 2014, 10(3),157-167. 45. Design, synthesis and biological evaluation of novel triaryl (Z)-olefins as tamoxifen analogues. Abdellatif, K. R. A.; Belal, A.; Omar, H. M. Bioorganic & Medicinal Chemistry Letters 2013, 23, 4960-4963. 46. Synthesis of rofecoxib analogs of expected antiinflamatory activity. Abdellatif, K. R. A.; Abdelgawad, M. A.; Helmy, N. A. Der Pharmacia Lettre 2013, 5(2), 228-237. 47. Synthesis of novel subistituted 4H-chromenes and their antioxidant screening. Abdelgawad, M. A.; Elshemy, H. A. H.; Abdellatif, K. R. A.; Omar, H. M. Journal of Chemical and Pharmaceutical research 2013, 5(1), 387-394. 48. Synthesis and antimicrobial activity of novel 2-subistituted-1H-benzimidazole derivatives. Abdellatif, K. R. A.; Elshemy, H. A. H.; El-Badry, O. M.; Ragab, H. M.; El-Enany, M. M. Organic Chemistry An Indian Journal 2013, 9(3). 49. Ethanesulfohydroxamic Acid Ester Prodrugs of Non-steroidal Anti-inflammatory Drugs (NSAIDs): Synthesis, Nitric oxide and Nitroxyl Release, Cyclooxygenase Inhibition, Anti-inflammatory and Ulcerogenicity Index Studies. Huang, Z; Velázquez, C. A.; Abdellatif, K. R. A.; Chowdhury, M. A. ; Reisz, J.; DuMong, J.; S. Bruce, S. B.; Knaus, E. E. Journal of Medicinal Chemistry 2011, 54, 1356-1364. 50. A diazen-1-ium-1,2-diolated nitric oxide donor ester prodrug of 3-(4-hydroxymethylphenyl)-4-(4-methanesulfonylphenyl)-5H-furan-2-one: Synthesis, biological evaluation and nitric oxide release studies. Abdellatif, K. R. A.;Huang, Z; Chowdhury, M. A ; Kaufman, S.; Knaus, E. E. Bioorganic & Medicinal Chemistry Letters 2011, 21, 3951-3956. 51. Synthesis of phenylacetic acid regioisomers possessing a N-substituted-1,2-dihydropyrid-2-one pharmacophore: Evaluation as inhibitors of cyclooxygenases and 5-lipoxygenase. Ya, G.; Chowdhury, M. A ; Huang, Z; Abdellatif, K. R. A.; Knaus, E. E. Canadian Journal of Chemistry 2011, 89, 617-622. 52. Triaryl (Z)-olefins suitable for radiolabelling with iodine-124 or fluorine-18 radionuclides for positron emission tomography imaging of estrogen positive breast tumors. Abdellatif, K. R. A.; Velázquez, C. A.; Huang, Z;; Knaus, E. E. Bioorganic & Medicinal Chemistry Letters 2011, 21, 1195-1198. 53. Synthesis and biological evaluation of indomethacin analogs possessing a N-difluoromethyl-1,2-dihydropyrid-2-one ring system: A search for novel cyclooxygenase and lipoxygenase inhibitors. Chowdhury, M. A.; Huang, Z.; Abdellatif, K. R. A.; Dong, Y.; Ya, G.; Velázquez, C. A.; Knaus, E. E. Bioorganic & Medicinal Chemistry Letters 2010, 20, 5776-5780. 54. Comparison between NO-ASA and NONO-ASA as safe anti inflammatory, analgesic, antipyretic, anti-oxidant prodrugs. Chattopadhyay, M.; Velazquez, C. A.; Pruski, A.; Nia, K. V.; Abdellatif, K. R. A.; Keefer, L. K.; Khosrow K. Journal of Pharmacology and Experimental Therapeutics, 2010, 335, 443-450. 55. Acyclic triaryl olefins possessing a sulfohydroxamic acid pharmaco-phore: Synthesis, nitric oxide/nitroxyl release, cyclooxygenase inhibition, and anti-inflammatory studies. Huang, Z.; Velázquez, C. A.; Abdellatif, K. R. A.; Chowdhury, M. A.; Reisz, J.; DuMong, J.; S. Bruce, S. B.; Knaus, E. E. Journal of Organic and Biomolecular Chemistry 2010, 8, 4124-4130. 56. Triaryl (Z)-olefins suitable for radiolabelling with carbon-11 or fluorine-18 radionuclides for positron emission tomography imaging of cyclooxygenase-2 expression in pathological disease. Abdellatif, K. R. A.; Velázquez, C. A.; Huang, Z; Chowdhury, M. A.; Knaus, E. E. Bioorganic & Medicinal Chemistry Letters 2010, 20, 5245-5250. 57. Celecoxib prodrugs possessing a diazen-1-ium-1,2-diolated nitric oxide donor moiety: Synthesis, biological evaluation and nitric oxide release studies. Abdellatif, K. R. A.; Chowdhury, M. A.; Velázquez, C. A.; Huang, Z; Dong, Y.; Das, D.; Ya, G.; Suresh, M. R.; Knaus, E. E. Bioorganic & Medicinal Chemistry Letters 2010, 20, 4544-4549. 58. Synthesis and biological evaluation of N-difluoromethyl-1,2-dihydropyrid-2-one acetic acid regioisomers: dual inhibitors of cyclooxygenases and 5-lipoxygenase. Ya, G.; Rao, P. N. P.; Chowdhury, M. A.; Abdellatif, K. R. A.; Dong, Y.; Das, D.; Velázquez, C. A.; Suresh, M. R.; Knaus, E. E. Bioorganic & Medicinal Chemistry Letters 2010, 20, 2168-2173. 59. Celecoxib analogs possessing a N-(4-nitrooxybutyl)piperidin-4-yl or N-(4-nitrooxybutyl)-1,2,3,6-tetrahydropyridin-4-yl nitric oxide donor moiety: Synthesis, biological evaluation and nitric oxide release studies. Chowdhury, M. A.; Abdellatif, K. R. A.; Dong, Y.; Ya, G.; Huang, Z.; RAhman, M.; Das, D.; Velázquez, C. A.; Suresh, M. R.; Knaus, E. E. Bioorganic & Medicinal Chemistry Letters 2010, 20, 1324-1329. 60. Phenylacetic acid regioisomers possessing a N-difluoromethyl-1,2- dihydropyrid-2-one pharmacophore: Evaluation as dual inhibitors of cyclooxygenases and 5-lipoxygenase with anti-inflammatory activity. Ya, G.; Chowdhury, M. A.; Abdellatif, K. R. A.; Dong, Y.; Das, D.; Rao, P. N. P.; Velázquez, C. A.; Suresh, M. R.; Knaus, E. E. Bioorganic & Medicinal Chemistry Letters 2010, 20, 896-902. 61. Synthesis and antibacterial activity of novel quinoxalinone derivatives. Shaaban, M. A.; Khalil, M. O.; Abdellatif, K. R. A.; Lamie, P. F. Journal of Chemical Research, 2009, September, 574-578. 62. Synthesis and biological evaluation of salicylic acid and N-acetyl-2-carboxybenzenesulphonamide regioisomers possessing a N-difluoromethyl-1,2-dihydropyrid-2-one pharmacophore: dual inhibitors of cyclooxygenases and 5-lipoxygenase with anti-inflammatory activity. Chowdhury, M. A.; Abdellatif, K. R. A.; Dong, Y.; Das, D.; Velázquez, C. A.; Ya, G.; Suresh, M. R.; Knaus, E. E. Bioorganic & Medicinal Chemistry Letters 2009, 19, 6855-6861. 63. Diazen-1-ium-1,2-diolated nitric oxide donor ester prodrugs of 5-(4-carboxymethylphenyl)-1-(4-methanesulfonylphenyl)-3-trifluoromethyl -1H-pyrazole and its aminosulfonyl analog: Synthesis, biological evaluation and nitric oxide release studies. Abdellatif, K. R. A.; Chowdhury, M. A.; Dong, Y.; Das, D.; Yu, G.; Velázquez, C. A.; Suresh, M. R.; Knaus, E. E. Bioorganic & Medicinal Chemistry 2009, 17, 5182-5188. 64. Dinitroglyceryl and diazen-1-ium-1,2-diolated nitric oxide donor ester prodrugs of aspirin, indomethacin and ibuprofen: Synthesis, biological evaluation and nitric oxide release studies. Abdellatif, K. R. A.; Chowdhury, M. A.; Dong, Y.; Das, D.; Yu, G.; Velázquez, C. A.; Suresh, M. R.; Knaus, E. E. Bioorganic & Medicinal Chemistry Letters 2009, 19, 3014-3018. 65. Synthesis of celecoxib analogs possessing a N-difluoromethyl-1,2-dihydropyrid-2-one 5-lipoxygenase pharmacophore: Biological evaluation asdual inhibitors of cyclooxygenases and 5-lipoxygenase with anti-inflammatory activity. Chowdhury, M. A.; Abdellatif, K. R. A.; Dong, Y.; Das, D.; Suresh, M. R.; Knaus, E. E. Journal of Medicinal Chemistry 2009, 52, 1525-1529. 66. Synthesis of 1-(methanesulfonyl- and aminosulfonylphenyl)acetylenes that possess a 2-(N-difluoromethyl-1,2-dihydropyridin-2-one)pharmacophore: Evaluation as dual inhibitors of cyclooxygenases and 5-lipoxygenase with anti-inflammatory activity. Chowdhury, M. A.; Abdellatif, K. R. A.; Dong, Y.; Rahman, M.; Das, D.; Suresh, M. R.; Knaus, E. E. Bioorganic & Medicinal Chemistry Letters 2009, 19, 584-588. 67. Synthesis of new 1-(2-, 3- or 4-methanesulfonylphenyl)-2-[5-(N-hydroxypyridin-2(1H)-one)]acetylene regioisomers: A search for novel cyclooxygenase and lipoxygenase inhibitors. Chowdhury, M. A.; Chen, H.; Abdellatif, K. R. A.; Dong, Y.; Petruk, K. C.; Knaus, E. E. Journal of Heterocyclic Chemistry, 2009, 46, 58-61. 68. Synthesis of celecoxib analogs that possess a N-hydroxypyridin-2(1H)one 5-lipoxygenase pharmacophore: Biological evaluation as dual inhibitors of cycloxygenases and 5-lipoxygenase with anti-inflammatory activity. Chowdhury, M. A.; Abdellatif, K. R. A.; Dong, Y.; Das, D.; Suresh, M. R.; Knaus, E. E. Bioorganic & Medicinal Chemistry Letters 2008, 18, 6138-6141. 69. Diazen-1-ium-1,2-diolated nitric oxide donor ester prodrugs of 5-(4-hydroxymethylphenyl)-1-(4-aminosulfonylphenyl)-3-trifluoromethyl-1H-pyrazole and its methanesulfonyl analog: Synthesis, biological evaluation and nitric oxide release studies. Abdellatif, K. R. A.; Chowdhury, M. A.; Dong, Y.; Velázquez, C.; Das, D.; Suresh, M. R.; Knaus, E. E. Bioorganic & Medicinal Chemistry 2008, 16, 9694-9698. 70. Synthesis of new 4-[2-(4-methyl(amino)sulfonylphenyl)-5-trifluoromethyl-2H-pyrazol-3-yl]-1,2,3,6-tetrahydropyridines: A search for novel nitric oxide donor anti-inflammatory agents. Chowdhury, M. A.; Abdellatif, K. R. A.; Dong, Y.; Knaus, E. E. Bioorganic & Medicinal Chemistry 2008, 16, 8882-8888. 71. Synthesis of new 1-[4-methane(amino)sulfonylphenyl)]-5-[4-(aminophenyl)]-3-trifluoromethyl-1H-pyrazoles. Abdellatif, K. R. A.; Chowdhury, M. A.; Knaus, E. E. Journal of Heterocyclic Chemistry 2008, 45, 1707-1710. 72. Synthesis and biological evaluation of 1-(4-benzenesulfonamido)-2-[5-(N-hydroxypyridin-2(1H)-one)]acetylene regioisomers: A novel class of 5-lipoxygenase inhibitors. Chowdhury, M. A.; Chen, H.; Abdellatif, K. R. A.; Dong, Y.; Petruk, K. C.; Knaus, E. E. Bioorganic & Medicinal Chemistry Letters 2008, 18, 4195-4198. 73. Diazen-1-ium-1,2-diolated nitric oxide donor ester prodrugs of 1-(4-methanesulfonylphenyl)-5-aryl-1H-pyrazol-3-carboxylic acids: Synthesis, nitric oxide release studies and anti-inflammatory activities. Abdellatif, K. R. A.; Chowdhury, M. A.; Dong, Y.; Knaus, E. E. Bioorganic &Medicinal Chemistry 2008, 16, 6528-6534. 74. Diazen-1-ium-1,2-diolated and nitrooxyethyl nitric oxide donor ester prodrugs of anti-inflammatory (E)-2-(aryl)-3-(4-methanesulfonyl-phenyl)acrylic acids: Synthesis, cyclooxygenase inhibition and nitric oxide release studies. Abdellatif, K. R. A.; Chowdhury, M. A.; Dong, Y.; Chen Q. -H.; Knaus, E. E. Bioorganic and Medicinal Chemistry 2008, 16, 3302-3308. 75. Synthesis and cyclooxygenase inhibitory activities of linear 1-(methanesulfonylphenyl or benzenesulfonamido)-2-(pyridyl)acetylene regioisomers. Chowdhury, M. A.; Dong, Y.; Chen, Q. -H.; Abdellatif, K. R. A.; Knaus, E. E. Bioorganic & Medicinal Chemistry, 2008, 16, 1948-1956. 76. Novel (E)-2-(aryl)-3-(4-methanesulfonylphenyl)acrylic ester prodrugs possessing a diazen-1-ium-1,2-diolate moiety: Design, synthesis, cyclooxygenase inhibition and nitric oxide release studies. Abdellatif, K. R. A.; Dong, Y.; Chen, Q. H.; Chowdhury, M. A. Knaus, E. E. Bioorganic & Medicinal Chemistry, 2007, 15, 6796-6801.